Toronto is the capital city of the province of Ontario and the largest city in Canada by population, with 2,731,571 residents in 2016. Also in 2016, the Toronto census metropolitan area (CMA), the majority of which is within the Greater Toronto Area (GTA), had a population of 5,928,040, making it Canada’s most populous CMA. Toronto is the anchor of an urban agglomeration, known as the Golden Horseshoe, in Southern Ontario on the northwestern shore of Lake Ontario. A global city, Toronto is a centre of business, finance, arts, and culture, and is recognized as one of the most multicultural and cosmopolitan cities in the world. The flag of the City of Toronto has a medium blue field with a “T” shape in white. The trunk of the “T” is much wider than its crossbar, and is divided vertically by a blue bar which extends nearly to the base. The “T” is set toward the hoist, with the right edge of its trunk halfway to the fly. The crossbar curves upward slightly at both ends. A red Canadian maple leaf one-third the height of the flag is centred at the base of the “T”. The width of the trunk is one-fourth the flag’s length. The white band is supposed to resemble a T for the city's name, but also recalls the appearance of the City Hall building. The flag was adopted on the 140th anniversary of Toronto in 1974. The white object represents City Hall, one of the landmark buildings of the city, with its twin towers in silhouette forming a “T” on the flag for Toronto. The towers themselves curve toward the viewer at their outer sides, so the object on the flag creates a remarkably recognizable depiction of them. The maple leaf symbolizes the city council and recalls Toronto’s Canadian heritage. On 18 August 1974 the city council formed a Flag Design Committee comprising Alderman Paul B. Pickett, Q.C., and Reid Scott, Q.C., as co-chairmen, and Aldermen Edward Negridge, Colin Vaughan, and Anne Johnston as members. A competition was created with citizens invited to submit suitable entries. RobeRenato De Santis, a 21-year-old student at George Brown College. A blue-green horizontal bicolor with a white six-looped design toward the hoist. The chain-like shape symbolized the six cities/boroughs making up the whole. A dark blue(?) 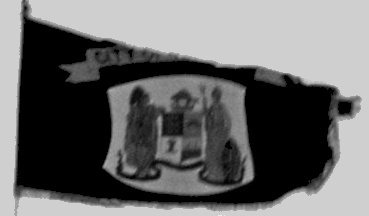 flag with the arms and a ribbon with the name above. Green field, white Canadian pale, on the pale a green cabbage. More pictures are available on the internet, the apparent colour differences are not relevant I suppose. Once seen, never forgotten! "[...] we're urging our combined, talented readers to design Toronto neighbourhood flags, starting with the eclectic Kensington!". Two flag proposals are shown on the websites of the organizing newspapers: The National Post and The Torontoist. "The National Post", 1 November 2007, shows the six finalist flags, including two flags proposed by someone we all know here (am I right to see the influence of Piet Mondriaan in these two "block" flags?). There are comments by the two columnists who organized the contest beside each proposal, and these comments are particularly sounded. Having lots of experience with flags and flag design, I see some flaws in the choice for Kensington. The colours would be well chosen if they appear in darker tones; light green and light yellow however will fade in the first sunlight that hits them. The K device is also ill-chosen - first off all it is readable from only one side of the flag (all words and letters on flags have this problem!) Secondly what does an 'Olde English' style of font have to do with the market neighbourhood, apart from the name of a street 'Kensington' of English origin. Secondly this particular mixed font is highly suggestive of a Chinese-language character; this would mislead. I recall in the late 1940s, when we lived on Spadina, we didn't call it Kensington Market rather it was known as the Jewish market. Keep, but darken, the colours because they are representative of baked goods (gold or bright yellow) and vegetables (greens, fruit) major market staples over many years. Substitute a bagel for the letter K and you got it. Kevin Harrington's article "Seven Cities in Search of a Flag" was published in the Communications of the XI International Congress of Vexillology (Madrid, 1985). The City of Toronto is one of the seven administrative units making up Toronto. The others are Metropolitan Toronto (covering the whole of the city - the City of Toronto is only the city centre) and the boroughs of East York, Etobicoke, North York, Scarborough and York. All of them had flags. Effective at the start of 1998, this federated structure was swept away by the provincial government and since then there has only been a single City of Toronto covering the whole area that used to be Metropolitan Toronto ("Metro").